The Viggen 37E has been developed by the Swedish Saab Industries. Sweden was the only user of this aircraft with 329 jets. The viggen has been withdrawn from service in 2005 and was replaced by the Saab gripen. The aircraft has capabilities for short take-off/landing. From the 329 aircraft there are different versions like: attack jet, training jet, 2 reconnaissance versions, a more powerful jet. 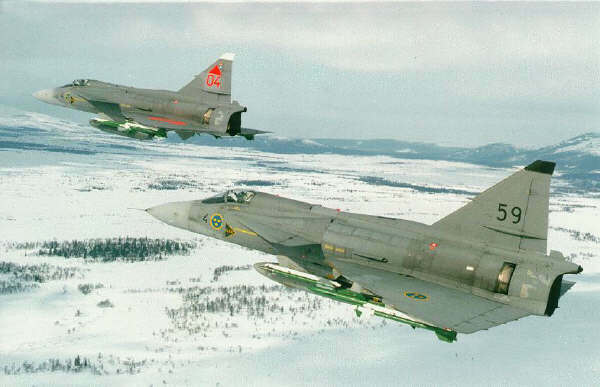 The more powerful version viggen jet has newer, avionics, newer air-to-air missiles en Europeans first pulse-doppler-radar. Just like the Saab Draken the Viggen has 2 delta wings. In front of the wings are 2 smaller deltawings assembled. The Saab Viggen can be equipped with bombs and has for self-protection a board canon.